Number 1 in an occasional series.. Spinning is at F’s house tomorrow. I know that she gets a bit fraught about the cake-making at the best of times and right now she is immensely busy with winter feeding each day, so I asked if I could bring a cake. My offer was accepted. This week I have a simple gingerbread, which always goes down well, and the recipe has been requested by some of the ladies – it’s high time that I got around to committing it to print. I thought it would be good to share Spinning Cake recipes here as well. 10. Pour into the lined tin. Bake for approx 75 minutes, until well-risen and just firm to the touch. Leave the lining paper on, then wrap in greaseproof paper, and foil. Leave the cake to mature for four to seven days… if you can. The best results come from using the best ingredients – quality butter, free range eggs, fresh quality spices… but you can still get a very edible cake if you have to substitute margarine (I did this week) etc. Try a tsp of ground cinnamon in the dry mix – I always include it. That, or a similar quantity of mixed spice, adds depth and complexity to the flavour. Play with the treacle elements: all golden syrup works just fine, for a lighter colour and flavour – I like to use half syrup/half runny honey, and honey alone works well too. I am not a fan of 100% black treacle however, but have subbed molasses for the 50% black treacle content with success. Demerara is not critical – any sugar will do. 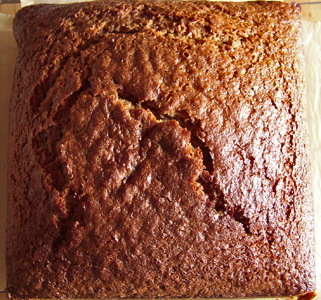 Soft Brown (use either the light brown, or the dark Muscavado, as appropriate to your treacle component) works well, and in a time of crisis, there’s nothing wrong with granulated or caster sugar either – unrefined golden types are best, but you need that cake, so use what you have. Include a little chopped mixed candied peel for a variation, or some chopped crystallised or stem ginger, or sprinkle some flaked almonds over the top before baking. Be flexible with the times and the temperatures. In my fan oven I bake this at 160Â°C and an hour is plenty long enough. 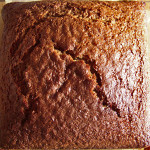 Keep checking and be careful not to overcook it -Â as a dry gingerbread cake is really rather without point, yes? Unfortunately, today’s example is less than perfect. Slightly overcooked, resulting in cracking. It also rose in the centre rather more than usual – I generally get a more level result with this recipe. I could have showed a prettier picture, but you might as well see the honest results! NB – my tin is 21cm square and about 8cm deep. This cake definitely gets better for keeping, even if only for a day – but longer is better. Slice and eat with a nice cup of tea or mug of coffee. If you are a Yorkshire lass like me, you may like to spread a little butter on first, or eat with an accompanying slice of mild cheese. A real “cut and come again” cake, this only gets better for as long as it lasts. Will feed a whole bunch of spinners, with plenty left over for husbands later. I really like your blog. I need to work on mine to make it more interesting. Thanks for the great gingerbread. I think I will try it.